Two years ago at UX Bristol, we (fffunction, a design agency in the South West of the UK) ran a workshop on creating interactive prototypes. It was a bit of a turning point for us in terms of our approach to prototypes; we realized that there was a wider interest in prototype creation than weâ€™d thought existed up until that point. We saw that this interest came from designers of all kinds, many of whom donâ€™t have the technical skills to create prototypes using HTML and CSS. And it was also where we got to share our enthusiasm for prototypes with one Mr Joe Leech. Fast forward two years, and Joe invited us to write a book on interactive prototypes as part of a series he was editing for SitePoint. The book is called Designing UX: Prototyping. Its aim is to help anyone get enough background to pick a prototyping toolset and use it to create a prototype. Those people arenâ€™t necessarily experienced designers or developers– they could be product managers, or in marketing roles, for example. Once again we were jolted back to the realization that thereâ€™s an appetite for interactive prototyping across a wide audience with different priorities, different design projects, and different skill sets. We knew that a big part of writing a book for this audience would be to spend a lot of time researching, experimenting, and creating prototypes. We’d also need a much wider range of toolsets than we were used to working with day-to-day. A really useful starting point was to invite folk from all backgrounds to send us stories of their prototyping experiences (good and bad). We also discussed the toolsets theyâ€™d used. Writing the book has been an amazing six months or so for us. Weâ€™ve had the opportunity to learn about so many tools and techniques for creating prototypes. We put them to the test to understand the kind of projects and designers they suit. For us, the book-writing process has prompted a change in our own approach to how we use prototypes. Previously, weâ€™ve treated prototype creation as a significant line item in a project. It’s been something that we typically would allocate a dedicated designer and sizeable time and budget to. For many projects that will remain the case: weâ€™ll continue to use HTML prototypes and our teamâ€™s mix of front-end design and development skills to explore complex interactive elements and sites with large information architectures. Whatâ€™s changed is that weâ€™re aiming to use prototypes to explore design problems in all projects that we work on by default. Our project cycles typically involve a mix of user research, sketching, higher fidelity design work, and build. We now know that with the wealth of tools and techniques available today, we can use prototyping to bring benefits to all these stages on every project, without necessarily increasing time and budget. Letâ€™s take an example where weâ€™re using sketching to explore design ideas in a project. Typically, weâ€™ll be sketching up ideas for elements, features, and templates collaboratively. This will be either as a small project team or alongside clients and users in a workshop environment. Now, weâ€™ll aim to make those all those sketching sessions more powerful, creative, and engaging for participants by bringing prototyping into them. That might be by packing some mobile device cutouts and running our sketches through them, as shown below. Or we might use a tool such as Marvel or Keynote to take our sketches and stitch them together to create a clickable prototype that we can experiment with across different devices. If we bring prototyping into a workshop environment, everyone benefits from having something that they can pick up and interact with. Stakeholders can see designs taking shape in a way thatâ€™s more engaging than sketches, wireframes, and other design deliverables alone would be. And we can get users experimenting with our designs quickly, identifying problems and opportunities in our designs early. For some projects, such as those where weâ€™re working alongside a clientâ€™s teams, weâ€™re still asked to produce wireframes to capture our designs for layouts. Today, weâ€™ll typically use Sketch to do something like that. Now weâ€™ll strive to further improve our design process by using something like Marvel or InVision to bring those wireframes to life. We can automatically sync up designs for templates and elements in Sketch with a clickable prototype. We can share that prototype with the project team, stakeholders, and user research subjects quickly and easily. Since we started writing the book, weâ€™ve already used some of these techniques which are new to us on a handful of client projects. And weâ€™ve already seen increased client engagement as a result. On one project we sketched out templates and shared them on Basecamp, along with a link to a clickable prototype version which we created using Marvel. When we got together with the client to talk the sketches through, they were looking at and clicking around the prototype. And theyâ€™d shared it with other project stakeholders who probably wouldnâ€™t normally have got to see the sketches alone. As a result of having this fantastic opportunity to write a book on prototyping, Iâ€™m sure that fffunction will end up using, even more, toolsets to prototype our designs in new and different ways. And one of my key aims as fffunctionâ€™s UX director this year will be to get other people (whatever their job role or background is) doing the same. Weâ€™re going to use the book and follow-up materialsâ€”such as further blog posts and workshopsâ€”to do that. Itâ€™s an exciting challenge and opportunity for us and one that I hope lots of folk will join us in. How can you start learning about and introducing prototyping in your team/project? Itâ€™s well known that identifying and fixing problems in design is easier and cheaper if it can be done earlier in the process of design and build. Thatâ€™s because as the fidelity of the project weâ€™re working on increases, the effort involved in making changes increases. If we can test out early ideas to see if they work, in small chunks, then we can identify whether those ideas are going to work. To do this, we need to build prototypes. 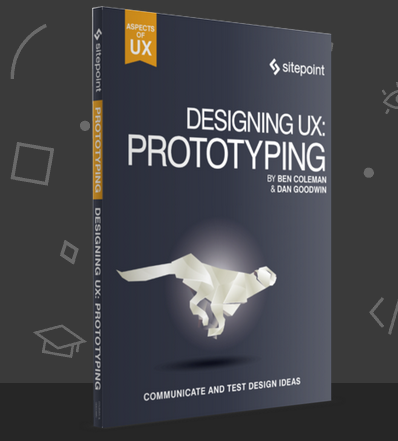 With easy-to-follow, practical advice, this book will show you how to use a number of different prototyping techniques. Itâ€™s aimed at beginner-level UX professionals, web designers, and developers who want to get a practical introduction to prototyping techniques. No prior experience with prototyping is assumed, so you can start from scratch. Check out what we’ll cover in each chapter. In this chapter, we explore what is prototyping? Why we should create prototype, and for which design projects. In this chapter we take some time to understand the prototyping process by looking at planning for, and the resources you’ll need. This is where we get our hands dirty. We take a look at some prototyping techniques and tools. 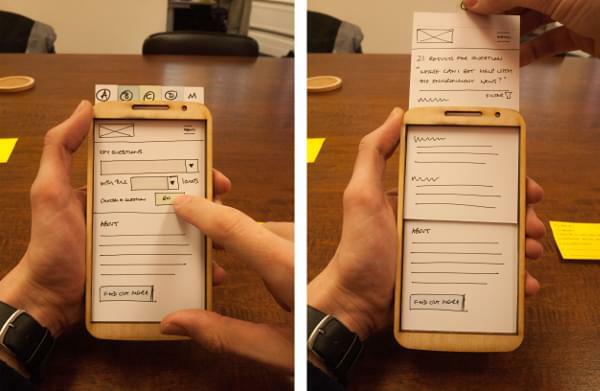 Just as shown above, we’ll show you how you can run through your own paper prototyping process. Prototyping isn’t just on paper, in this chapter we also look at interactive digital tools. Another hands on chapter, we’ll look at how to design our own digital prototypes. We’ll demonstrate how to create HTML prototypes. Communication is key, in this chapter we explore how to introduce your prototype into your team/client workflow. Prototyping is a great habit and highly recommended process to include in your workflow. It’ll reduce the number of design/development iterations, decrease cost and improve your customer engagements. If you’re interested in learning more, here’s a free chapter of our book to get you started. I’d love to hear how including this step in your process has improved your projects. Dan is the user experience director at fffunction. With a background of twenty years experience in agency and in-house software and web development, he is an all-rounder with strong technical and people skills in addition to user experience. He loves user research and bringing users and empathy for them into every step of a project.